- extract from a letter I wrote after my 1982 Arthurs trip. In the same letter I reported that we had only one day of rain in a whole week on the range. If the first day of our 2017 trip has me questioning my wisdom in coming with Mick and Eden this time, those earlier words show that it wasn’t solely a case of amnesia. On day 2 we wake to cloud. Showers are scudding by, and there’s a swirling wind up where we’ll be going today. We move slowly, timing our eating, toileting and packing up around breaks in the weather. Apart from anything else it’s so good just being in this stunning place that hurrying somehow seems out of order. Anyway I’m a little stiff and sore after yesterday, so slow is good. But after breakfast the degree of purpose grows, especially when a drying wind gives us a chance to pack up semi-dry tents. That done we have a quick look at the maps before hoisting our packs for the climb out of Lake Cygnus. Today is not a long day, just 2½ to 4 hours of “reasonably easy walking”, according to Chapman. That’s if you don’t do side trips to various peaks. And by the look of the cloud levels, we probably won’t be tempted to do that. That initial climb is tough first thing, but that’s the reality of most days on the Arthurs. 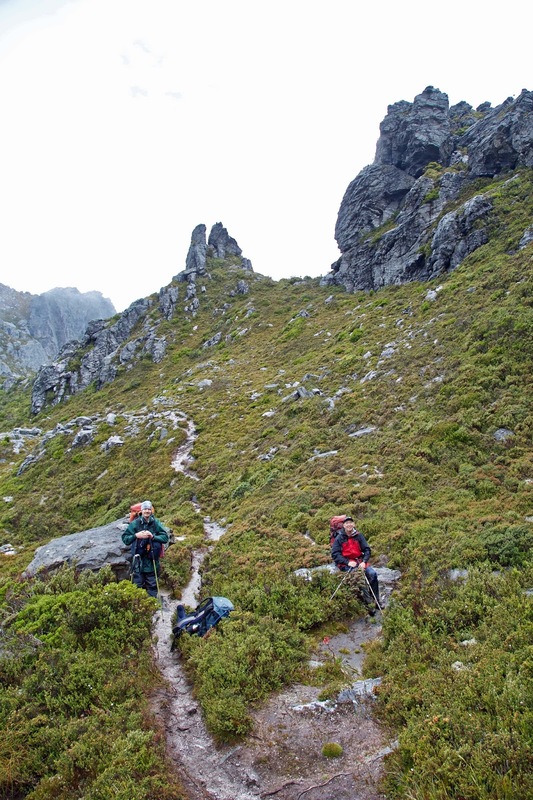 By the time we reach the ridge it’s cold and wet, and a keen breeze is whistling around the rocks. Somewhere above us is the cloud-shrouded bulk of Mt Hayes. We have to “sidle” around this, “descend steeply” from it, then “traverse” towards Square Lake. Take these innocent sounding words, mix them with showers, cold, thick cloud and a stiff breeze, throw in a rough and rocky track, and you end up with tough walking conditions. Even in the rarest, fairest of weather, this is not an easy walk. We shelter behind rocks in a saddle beneath Procyon Peak and have a quick lunch. The sun almost shines a few times, and we get glimpses of Hayes and beyond. 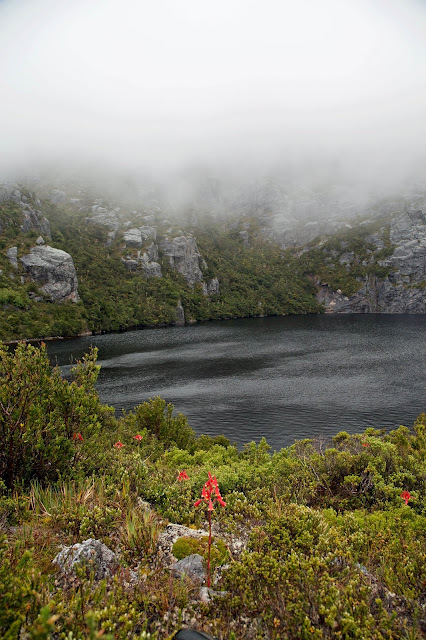 But by the time we’re slowly climbing back towards Square Lake, it’s raining again. 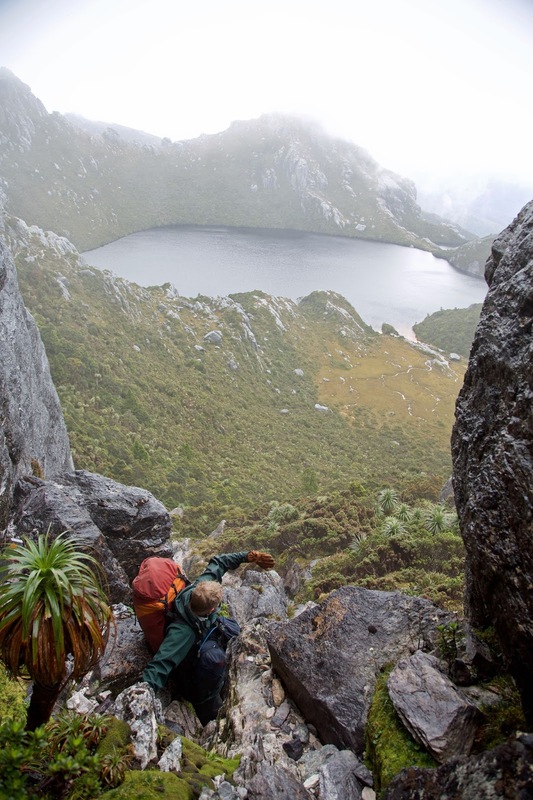 The ascending traverse from Square Lake to Lake Oberon is slow. Navigation is always tricky in clag. I remember that we have the mother of all “steep descents” to reach that lake, but by the time we reach it, the thick cloud disguises it. There might be a degree of mercy in that. As we peer down, there’s just a swirling grey abyss. 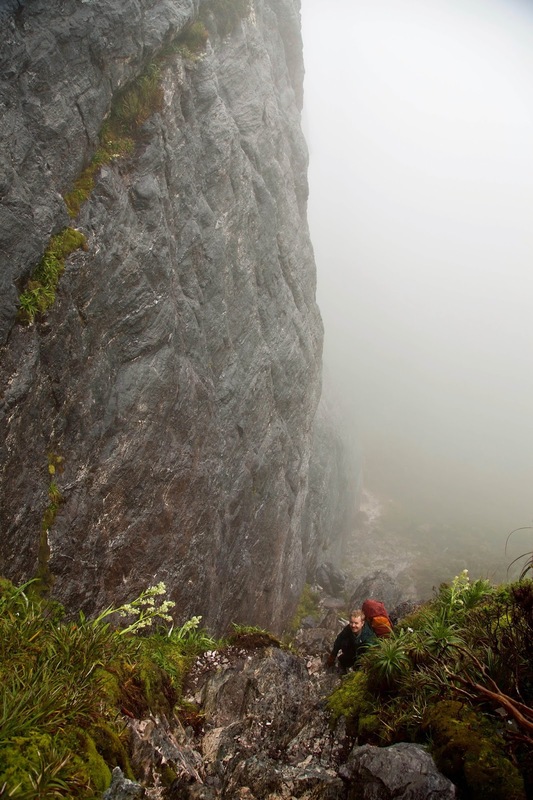 A dark cliff blends into the mist on one side, and on the other there’s just menacing mist. It becomes one of those tracks that you start to follow, decide must be wrong because it looks impossible, and look around desperately for a better way. Of course there isn’t a better way, and as though to convince us, we get a few glimpses of Lake Oberon way below us. Mick lets out an “Ah hah”, exultant that we’re getting close to this iconic place. Not wanting to get ahead of ourselves, we quickly re-focus on the immediate task. How do we actually get down? We talk about taking off our packs, and roping them down. Instead we put on our scrub gloves, to give us better grip on the cold, wet rocks. Then slowly, one at a time, each of us grips, grunt and bum-slides a little further down. We are keeping close to the improbable security of the cliff, which has water dripping from it. At the end of an already taxing day this is wearing, and scaring. In conditions like this we could easily fall and be seriously injured. When Eden, who is out front, let’s out a “woo hoo”, our mood suddenly lightens. It’s not the bottom – far from it – but it’s the end of the worst section. 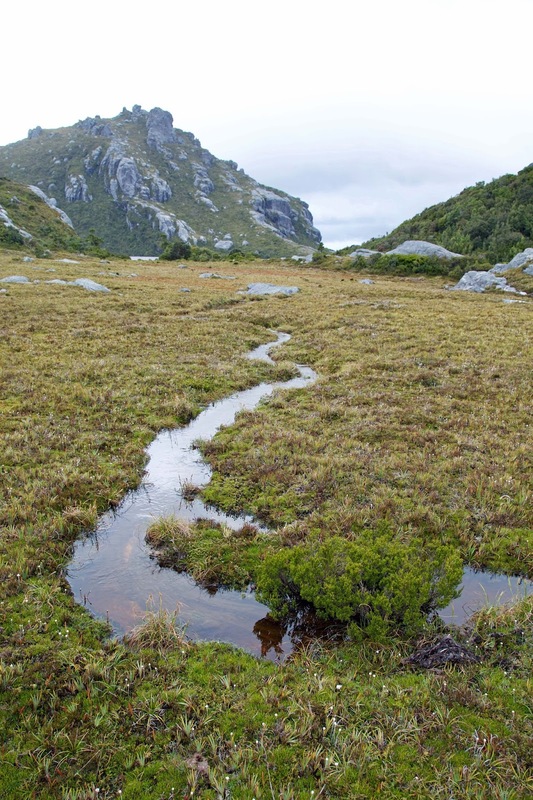 As if to reinforce that, we come to an unexpected section of boardwalk, which takes us on a circuitous route through wet forest, then onto rocky knolls, and finally down to Lake Oberon. We’re all glad, but Mick is ecstatic. 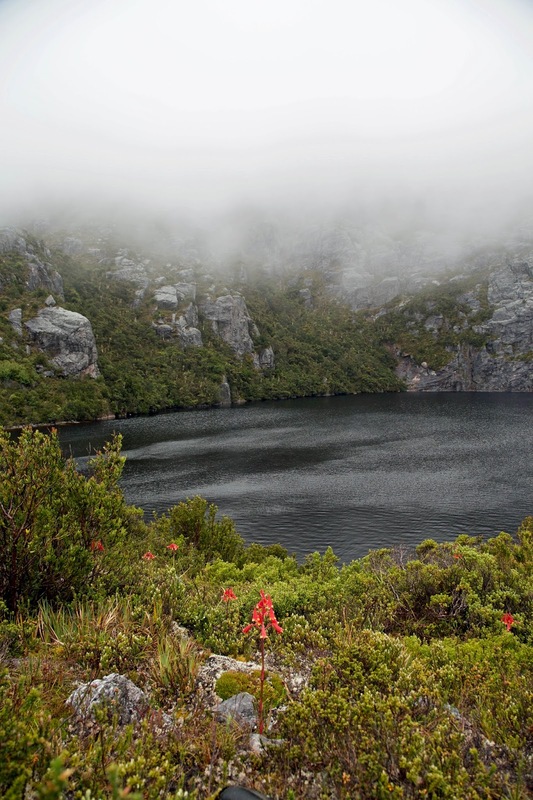 Like generations of those who love wild Tasmania, he has always admired Peter Dombrovskis’ photograph of Lake Oberon. As we set up our tents in the well-sheltered campsite, he admits that this is something of a pilgrimage for him. And despite – or even because of – the wild weather that’s followed us down here, he’s not at all disappointed with the reality of this place. Oh yes for Oberon!